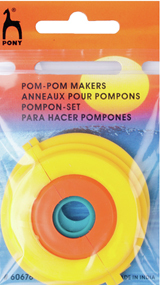 This pack contains two pairs of split pom pom makers. The large set makes 7.5cm pom poms and the medium set makes 5cm pom poms. The full small ring makes 3.5cm pom poms.